Through the years, wrestlers have taken to a mask to hide their identity for the sake of an angle. Sometimes it was the result of losing a "loser-leaves-town" match. Others were suspended or fired from the company. Regardless of the reason, the angles have provided some entertaining moments in wrestling history. It doesn't happen as much anymore, but a good example that immediately comes to mind is the Handsome and Mysterious Stranger in Chikara Pro. The man behind the mask is former band member "Marchie Archie" Archibald Peck. It's part of the ongoing love triangle with Archie, Mr. Touchdown, and Veronica. After Archie lost a loser leaves Chikara match earlier this year, he disappeared from the company. But recently, the Handsome and Mysterious Stranger emerged. 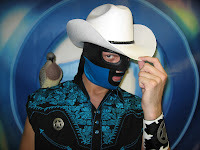 Fans clearly know it's Peck under the mask, but as you'll find with Chikara fans, they are a different breed. They (we've) embraced the angle and those in attendance chant "who are you?" or something along those lines. The fans help keep the mystic alive. In the 80's, we saw more of these angles. Who can forget the Machines. 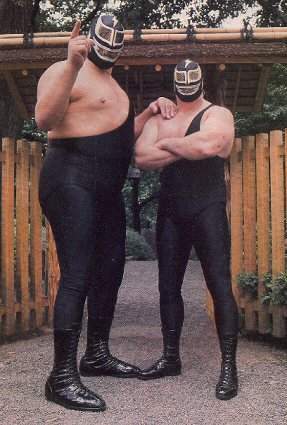 The group of Japanese masked men arrived shortly after Andre the Giant was suspended from the WWF. Andre was of course Giant Machine. Bill Eadie who became Demolition Ax played Super Machine and Blackjack Mulligan was Big Machine. It was obvious to everyone except baby face announcers Vince McMahon and Bruno Sammartino that Andre was under the mask. Eventually there was even a Hulk and Piper machine with Hulk Hogan and Roddy Piper in those roles respectively. My memory is hazy on the Midnight Rider, but he came to life after Dusty Rhodes was beaten by Kevin Sullivan in a loser leaves Florida match. That happened in 1983. This was right before I started watching wrestling regularly, so I have no memory of this, but a couple years later, the Rider came back in main stream NWA when Dusty lost a stipulated match. I don't remember who it was against, but I remember him coming out in the garb and helping other faces on the roster in battling the Four Horsemen. Again, it was clear Rhodes was the masked man, but it was fun none the less. Hulk Hogan donned a mask as Mr. America in the early 2000's on SmackDown! to battle Mr. McMahon and Roddy Piper. Brian Pillman became the Yellow Dog in the NWA, and the Von Erich brothers were at one time the Cosmic Cowboys in World Class. 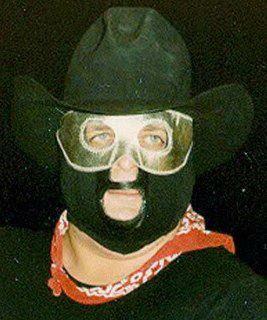 Who were some of your favorite masked men in disguise? Even more recently in WWE, The Miz went under a hood to win a contract as "The Calgary Kid."